In our outer zones where forest are heavily wooded or thick with regeneration, swales, terracing, and keyline are often out of the question. However this does not prevent us from working on contour with brush piles, either chipped or whole branches. 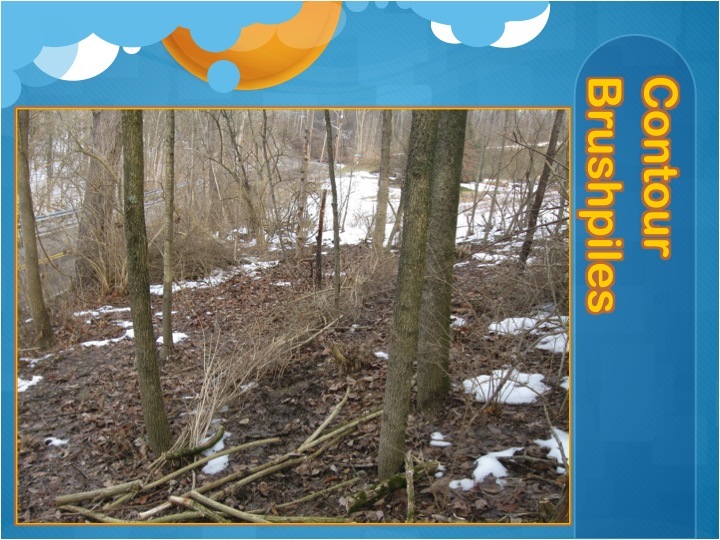 Utilizing invasives, coppice species, or in tropical settings tree trunks or banana trunks, contour brush piles help to create and maintain edge in the forest. A Latin American equivalent (seen by the author in Italy in 2013), bio-rollo, is a braided mass of organic material and branches laid on contour to help with dew accumulation (see more below). Both styles help to foster a slowing down process of water and organic matter. Having tried this practice in several woodlots in the eastern deciduous forest of the states, I have seen it work. They hold leaves and deer manure that tends to run with our clay and fairly steep slopes in the Cincinnati, Ohio, USA bioregion thus ore effectively cycling energy. There I mainly utilize bush honeysuckle (Lonicera maackii), seen above, an invasive from Eurasia that coppices well and placed below a deer trail as they tend to walk on contour. I don’t mind the species per se but it does tend to push out the native Paw Paw (Asimina triloba). Being in the tropical fruit family of the Anona or Custard Apple, this tends to be unacceptable to me for the Paw Paw’s is a true wild forage delight. Also native species like Spicebush (Lindera benzoin) also come through along side Redbud (Cercis canadensis) with edible flowers, Sassafras (Sassafras albidum) with it’s amazing smell and medicinal roots, and Dogwood (Cornus florida) with its showy white flowers. In more mature systems I have witnessed Paw Paw begin to dominate stands that were once occupied solely by bush honeysuckle before the chop and drop process began. Admittedly after my Fish and Wildlife Management training in that ecosystem from 2001-2004, I cleared lots of Honeysuckle and Multifora Rose (Rosa multiflora) , another Eurasian invasive, with mechanical means with the help of many friends out at the family land in Northern Kentucky. We used to burn it afterwards because it was so prolific and abundant we didn’t know what to do with the organic matter. I hadn’t gotten into Permaculture yet and learned from greats like Rick Valley out at Lost Valley Education Center or read books like Rainwater Harvesting from Brad Lancaster. From them I learned principles like energy cycling and edge. From there this technique made sense and I began to lay the material on contour instead of burning it. This creates a fungal bump I like to call it, the water is slowed, the organic material trapped and intertwined with the brush, setting up conditions for good fungal breakdown. The honeysuckle coppices or pollards meaning in a couple of years time or the following year you can come in and cut again the material to renew the pile. In some instances I have cut the next year because the supple spring growth is not yet woody and can be set back quickly with a rice knife. If you let it go for a year a brush ax or pruning saw is necessary. Hatchets, timber saws, pruning saws, and even axes have been used by myself and others to clear large tracts of this at the family land. Plans to integrate goats to further control the invasive will allow the regrowth turn from a problem into a solution. When the forest is regenerating, you can use these piles as a guide to implement your next layer of succession. Planting your native understory trees and herbaceous plants above and below the brush pile is a good idea. Also the pile themselves give habitat for small mammals and insects letting other wildlife come in and predate. 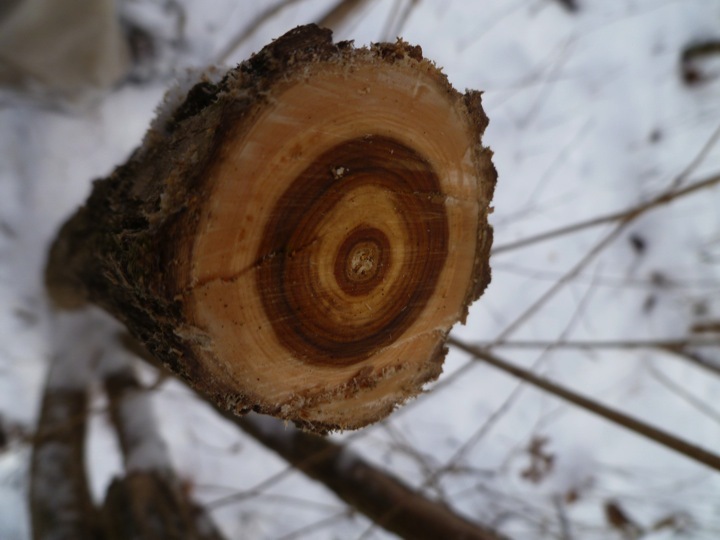 Creating edge does all sorts of trickle down benefits so let this strategy help you when managing woodlots in zone 3 and 4. You can take treetops from tree felling and even arrange trucks and larger branches to this effect. Brad Lancaster even recommends doing piles of wood chips on contour if you can chip the brush and have plentiful enough amounts of organic material. Furthermore, he biorollo, is a great way to utilize a heap of organic material in an elongated fashion and use capillary action to move water around a site and to create edge to wring out morning dew. In the mediterranean climates where dew is vital for site hydration this edge effect is an effective approach at spreading the hydration through a line and giving fungal foods. This is a great application for regenerating lands and can be used in emerging or established food forests. The process is simple with the a base layer of sticks being laid out in a long, 5-15 meters, with the width about 50 CM’s wide. Then continue to add organic material of all sorts and weave it inwards as you go. If you really take the time to weave you won’t need string, but nonetheless, a string around to cinch it all together helps dramatically. It’s definitely a project of many hands make light work. Check out the slideshow below from a PDC that I was co-teaching in Italy in 2013. Thanks so much to the wise mater Saviana Parodi for showing us all the technique and the great team that we formed to create the biorollo. Hey, you stole my idea (ha, ha). Actually, though, this was all we had time to do in the Dominican Republic before we had to leave our property there. 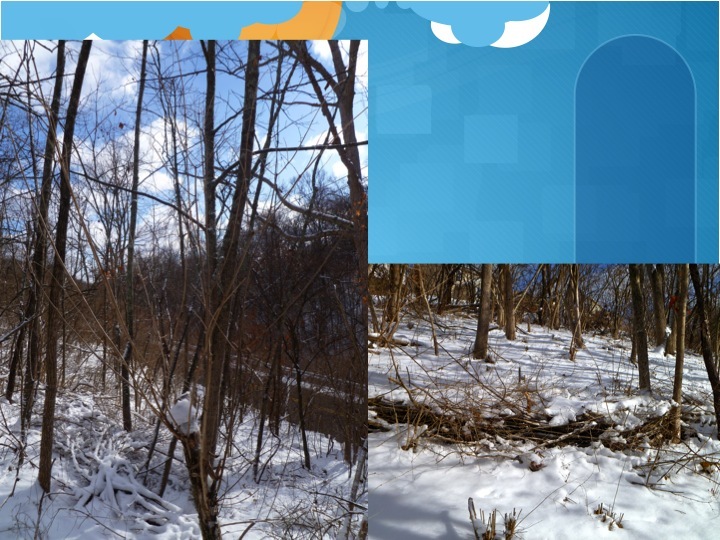 I am very curious what changes have happened on the land since we set out the brush piles. This is also what I have been planning to do at Forkland Road. I am just hoping it won’t create a niche for poison ivy to become prolific. What do you think? i hope in the DR it has helped some natural succession to take place as soils were stabilized locally in the area of the brush piles. I imagine some seeds were dropped by birds landing on the edge, organic material accumulating and that extra bit of moisture to help get things rolling in that tough part of the DR that you are in. As for down in Kentucky, edge will definitely create habit for things to grow. The problem is the solution as poison ivy berries are much prized by wildlife. Practically, regular walking on them helps to squash them down and get them in contact with the ground and fungus. coming through cutting the ivy is your best solution and goats love it too! I’ve seen similar applications with kudzu. Kudzu, while considered a problematic invasive, is also a nitrogen-fixing plant that does a magnificent job of holding soil on slopes. So, when we remove it, we are often re-creating the erosion problem it was ecologically designed to fix. A very shallow swale was dug in this case, and the kudzu vines were rolled into “bales” and placed in the swale. Then, the root crowns of the kudzu were dug out, and the space was cleared and ready for re-planting. I’m working now to help some folks removes tons (literally) of invasive english ivy from their land. I’ve been trying to think what to do with it. I wonder if this method could be hybridized with hugelkultur methods? Perhaps by piling soil on the uphill side of the brush pile, creating a sort of biodegradable terrace. As the brush breaks down and is no longer able to hold the soil, plants are moving in and establishing their root networks. Just a thought on a rainy Sunday here in Southern Appalachia! Cool. We have been doing something similar also. We have a lot of deadfall in the wooded areas of our property due to a disease in some of the trees. When I walk in the woods I simply try to change the angle of some of the fallen brush so that it lays on contour. We also clean some of the larger trees up to use as firewood but I use the branches and leaves/needles and create hugulkultur swales on our steeper sandy slope to build soil. I also like doing this brush piling on contour and now I can better explain why I do it to those that ask! Cheers! yeah its a fun technique that i think has great value in the landscape. i find myself doing mini terraces with them a lot in Portugal in the forest garden to help with containing soil as well. I use cane grass, similar to bamboo and weave like a basket. fun!